J.D. ; Ross, A.M.; Nasim, S.; Garrett, C.T. Nested poly-merase chain reaction assay for the detection of cytomeg-alovirus overcomes false positives caused by contamination with fragmented DNA. J. Med. Virol. 1990, 30 (2), 85-91. Echevarria, J.E. ; Avellon, A.; Juste, J.; Vera, M.; Ibanez, C. Screening of active lyssavirus infection in wild bat populations by viral RNA detection on oropharyngeal swabs. J. Clin. Microbiol. 2001, 39 (10), 3678-3683. Avellon, A.; Perez, P.; Aguilar, J.C.; Lejarazu, R.; Echevarria, J.E. Rapid and sensitive diagnosis of human adenovirus infections by a generic polymerase chain reaction. J. Virol. Methods 2001, 92 (2), 113-120. Tenorio, A.; Echevarria, J.E. ; Casas, I.; Echevarria, J.M. ; Tabares, E. Detection and typing of human herpesviruses by multiplex polymerase chain reaction. J. Virol. Methods 1993, 44, 261-269. Casas, I.; Tenorio, A.; Echevarria, J.M. ; Klapper, P.E. ; Cleator, G.M. Detection of enteroviral RNA and specific DNA of herpesviruses by multiplex genome amplification. J. Virol. Methods 1997, 66, 39-50. Casas, I.; Pozo, F.; Trallero, G.; Echevarria, J.M. ; Tenorio A. Viral diagnosis of neurological infection by RT multiplex PCR: A search for entero- and herpesvirus-es in a prospective study. J. Med. Virol. 1999, 57, 145151. Pozo, F.; Tenorio, A. Detection and typing of lymphotropic herpesviruses by multiplex polymerase chain reaction. J. Virol. Methods 1999, 79, 9-19. Fedele, C.G. ; Ciardi, M.; Delia, S.; Echevarria, J.M. ; Tenorio, A. Multiplex polymerase chain reaction for the simultaneous detection and typing of polyomavirus JC, BK and SV40 DNA in clinical samples. J. Virol. Methods 1999, 82 (2), 137-144. Aguilar, J.C.; Perez-Brena, M.P. ; Garcia, M.L. ; Cruz, N.; Erdman, D.D. ; Echevarria, J.E. Detection and identification of human parainfluenza viruses 1, 2, 3, and 4 in clinical samples of pediatric patients by multiplex reverse transcription-PCR. J. Clin. Microbiol. 2000, 38 (3), 11911195. Mosquera, M.M. ; de Ory, F.; Moreno, M.; Echevarria, J.E. 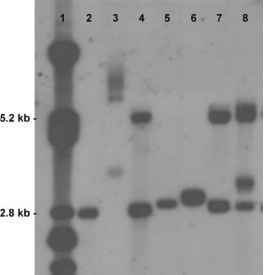 Simultaneous detection of measles virus, rubella virus, and parvovirus B19 by using multiplex PCR. J. Clin. Micro-biol. 2002 Apr., 40 (4), 1574. Coiras, M.T. ; Perez-Brena, P.; Garcia, M.L. ; Casas, I. Simultaneous detection of influenza A, B, and C viruses, respiratory syncytial virus, and adenoviruses in clinical samples by multiplex reverse transcription nested-PCR assay. J. Med. Virol. 2003, 69 (1), 132-144. Sanchez-Seco, M.P. ; Echevarria, J.M. ; Hernandez, L.; Estevez, D.; Navarro-Mari, J.M. ; Tenorio, A. Detection and identification of Toscana and other phleboviruses by RT-nested-PCR assays with degenerated primers. J. Med. Virol. 2003, 71 (1), 140-149. Fedele, C.G. ; Avellon, A.; Ciardi, M.; Delia, S.; Tenorio, A. Quantitation of polyomavirus DNA by a competitive nested polymerase chain reaction. J. Virol. Methods 2000 Jul., 88 (1), 51-61.